Access to an abundance of passive abilities that are useful even when the ally is neutralized causing opponent to look more towards removal. May cause opponent to temporarily neutralize then pursue removal. Currently these allies are Wulven Traitor, Wulven Scout, Wildfang, and Wulven Tactician. 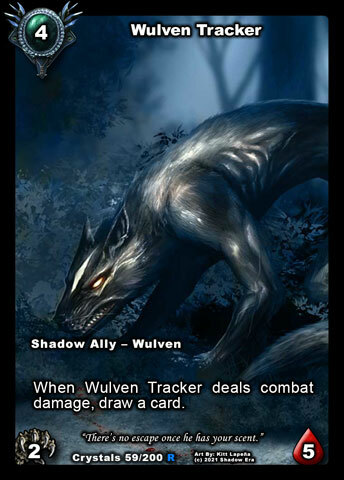 Notes: Wulven Traitor currently is the only 2cc ally. While he has neither aggressive or defensive base stats he makes up for in assisting the swarming potential of the alignment. Coming in at a low cost allows him to be played prior to a second ally so that you can draw a card at the end of your turn. Due to not being unique, you can stack the draw with other Wulven Traitors. 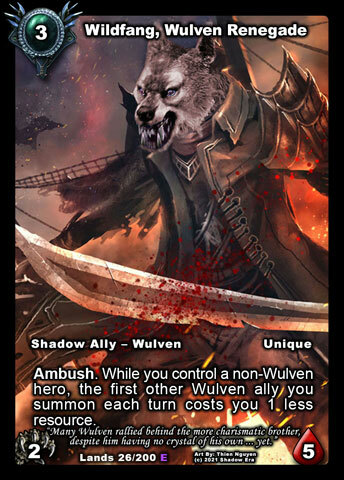 Since the base stats are rather underwhelming there is a conditional Ambush option while being the lone Wulven ally on the board. This helps with survivability while bring on reinforcements. This also allows him to be played outside of Wulven builds being a 1/3 Ambush generally all the time except when you decide to play another Traitor in which case you will draw a card and lose the Ambush. Generally because of the amount of cards u can potentially draw opponents will look to remove him from the board vs just neutralizing him. Notes: Bad Wolf has existed since Call of the Crystals and much before the Wulven Alignment had been fleshed out. He has the tone of the aggressive stats of the alignment and plays a nice role in dealing non-lethal damage and being able to heal himself up. This usually only works if you have other more threatening allies on the board and Bad Wolf is able to heal over time. 4 Health is not hard for most opponents to deal with and probably would have served better as a 2/5 but you can not go back. I think as more 3cc Wulven allies are added Bad Wolf will end up getting left out for more tool box options. 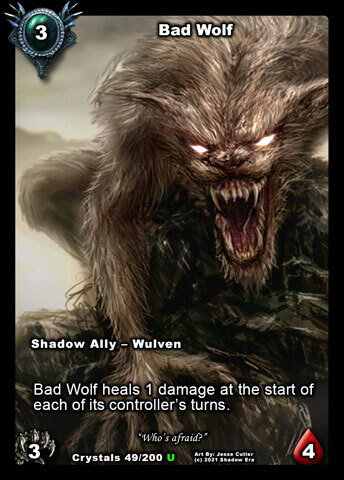 Bad Wolf will play favorably with things that increase health and/or prevent damage and can be used outside of Wulven Alignment though many 3/4 and 2/5 allies are already better choices. Notes: Being able to deal with Stealth is a very important part of deck build, and is usually done with ability damage. 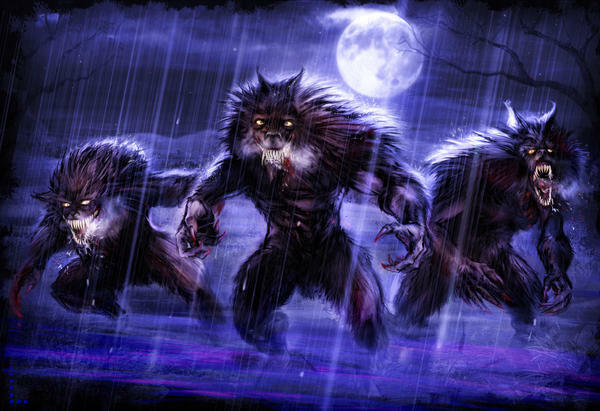 The Wulven alignment does not have access to any allies with ability damage and rely more on physical combat. Because of this Wulven Predator is being able to bypass Stealth is a clever way of giving them access to attack Stealth. That alone would not necessarily justify using Wulven Predator so he also has access to bypass Protector. This is also very synergistic as something a Wulven would be able to do, find its desired prey no matter what to attack it. 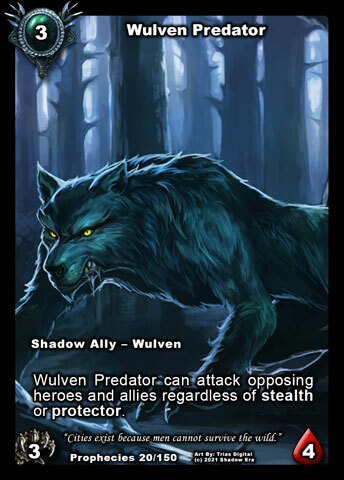 Wulven Predator doesn’t quite have the attack power to kill and so will potentially take retaliation damage so pairing him with Attack Boosts and/or Health Boost can serve him well. Notes: Wulven Scout has an excellent ability. Being able to view your opponents hand can help you decide on the best way to spend the remainder of your resources or how to approach the board. Scout has great aggressive stats being an ally that must be dealt with, however due to the passive ability effects that cripple are not as effective and you can still gain value from the body on the board. Notes: Wildfang is a Wulven ally that actually provides some defensive stats which the alignment is generally not geared towards. This provides a survivable ally, but is also limited by his Uniqueness so you cant have multiples on the board at a time. Wildfang also has a limited Ambush allowing for chip damage while he is the only ally on the board which also helps towards his survivability. 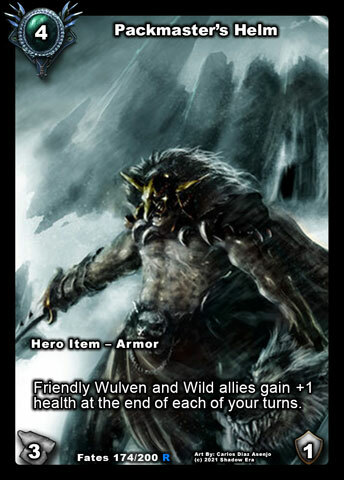 Wildfang also helps with Swarm Tactics as his secondary passive helps reduce the cost of other friendly Wulven allies. This passive generally helps keep the deck cost down and increase the comboability of playing 2 or more cards in a turn. This cost reduction also generally means opponent will look to remove him from the board vs just neutralizing him on the board. Notes: Wulven Tracker doesn’t have either threatening or defensive base stats. This puts him as a harder option to choose as you will have to be able invest other ways to help him trigger his attack, such as Haste, health modifiers and protection type cards. If you can get him on the board, especially alongside other more threatening allies, you can generally start to trigger his passive ability for drawing cards which is his only purpose. 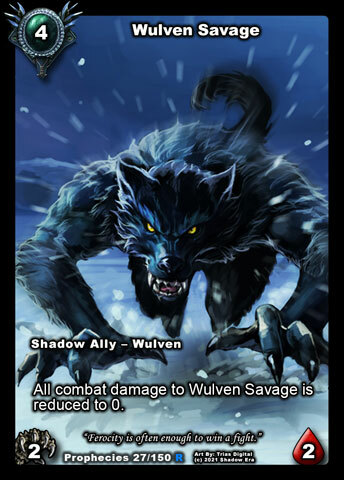 Notes: Wulven Savage is a great ally to go along with the Wulven Tribe strategically providing a strong option for combat damage. He is excellent at wearing down allies and Weapon durability, but is extremely weak to ability damage. This weakness can be lessened with the assistance of Wulven Tactician as well as anything that increases health. 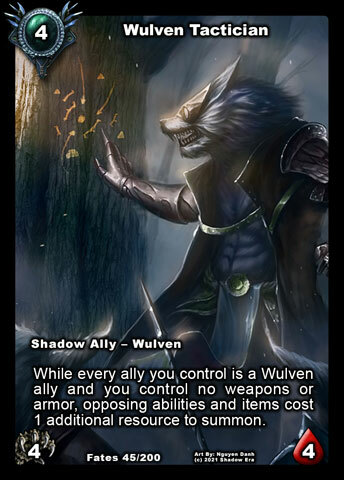 Notes: Wulven Tactician is the current fatty of the Shadow-Wulven Alignment. Tactician has excellent base stats which pair favorably with haste and combined with his passive ability make him as an ally that must be removed from the board. The passive ability helps to minimize the effectiveness of opponents abilities (and items) by either reducing their comboability or pushing back the turn in which it can be used. The Shadow-Wulven Alignment generally play on low resources so this helps offset the sacking of resources (early) or combos well with cards such as Here be Monsters to control how opponent is able to proceed moving forward. Wulven Scout is a great ally to pair Tactician with to help determine when may be an appropriate time to put Tactician on the board. Tactician has a limitation where his ability does not work when combined with weapons/armor. Notes: Honestly I am not much of a fan of Packmaster’s Helm. Essentially you need to pay 4cc for the armor and have some allies on the board to gain some health. The amount of health gained (and at a slow rate) does not do much to keep your allies alive and the cost to pay for this is hard to combo with an ally same turn until you get to 6-7 resources. Most Wulven decks don’t go that high in resources so generally unless you are playing Baduruu or Bloodfang you are not doing much else on that turn. 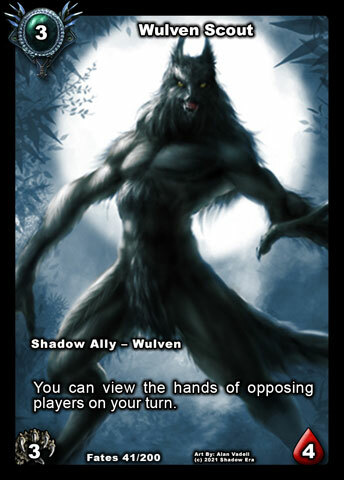 The Shadow Faction is a bit more geared towards the aggressiveness of the Wulven Alignment and this takes them in a different direction, where there really is only Wildfang and potentially Bad Wolf who can get some immediate benefit from using it. Other alignment armors are cheaper in cost and have more beneficial immediate gains (ex: Splicers Crown 2cc exile an ally in graveyard and 1 friendly ally gains +1 attack and +1 health). Packmaster’s Helm may affect multiple allies, but if summoned same turn only affects 1 ally not bringing any of them outside of Supernova range (except Unique Wildfang). If you already have the board with several allies, a card like Bloodlust granting +2 attack to friendlies will probably be a better play. NOTE: If Playing Elementals Breastplate of Vitality gives all friendly allies +2 health. Not permanent but more immediately useful as 6 hp allies can survive Supernova. If I was going to play an armor it just seems that class options would work better, except with Mages but again Packmaster’s Helm does not help survival against Supernova. 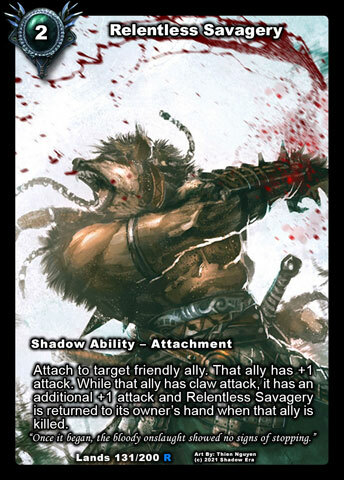 Notes: While Relentless Savagery is not specifically worded to be a Wulven alignment card, every ally has Claw attack so it works with them extremely well. Savagery boost their aggressive flavor in a variety of ways. This boost the attack of your allies by 2, and becomes a renewable card being able to be recycled upon the death of the ally it is attached to. Notes: Since the Shadow-Wulven Alignment typically operate on a lower resource count, being able to play attachments for free (or lower cost) is a nice way to apply options to without forcing them to go higher in resource count. Currently there are a variety of attachments available to all Classes, to make this an interesting location to pair them with and branch out how to use them. 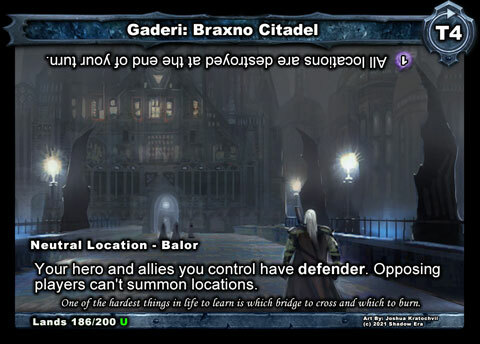 Notes: Gaderi: Braxno Citadel is actually one of my favorite locations to use with the Wulven Alignment. They all (for the most part) have excellent aggressive stats which typically means that opponent is going to either ignore them for a turn or attempt to use abilities for removal. This can be combated strategically with Wulven Scout and Wulven Tactician to determine the best way to work on countering their counters. In addition this is great location and hero ability tech. 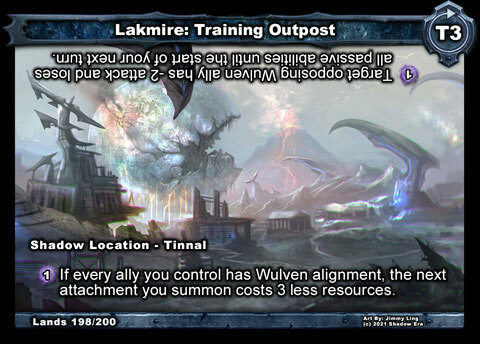 Notes: In general, Support Abilities, all lean towards some sort of strategic manipulation that can benefit your Wulven build in some way. 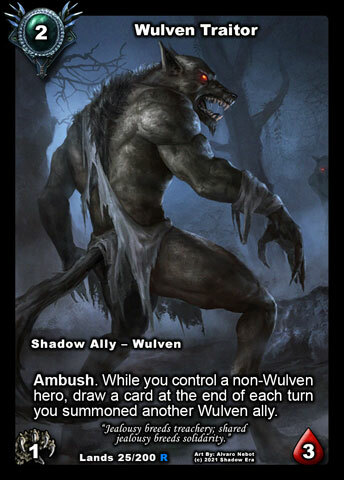 The Shadow Support abilities emulate the aggressive nature of the Wulven alignment all providing a boot to attack, and Nocturnal Advantage also help with Stealth by dealing with their lack of ability damage. The Neutral Support Abilities lend to a tool box approach on various control techniques, which can be deployed in the right circumstance to lead you to victory, however lots of the cards can be dead drops depending on the match up and with no current “Seek” Function a toolbox approach is inconsistent. Hunters have no Support Abilities (have Traps instead) and must rely solely on the Shadow/Neutral options. Warriors have some protection helps, but allies are still left vulnerable to abilities. Mages have Portal which goes very well with the aggressive stats of the alignment. Elementals have some interesting Support Abilities which are more toolbox, similar to the Neutral Abilities, working in favor of Discard and/or Hero ability control. The Wulven Class (not featured in this article) also have the most Support Abilities of all Classes so this location happens to be synergistic tying the Alignment to the Class though they are separate. 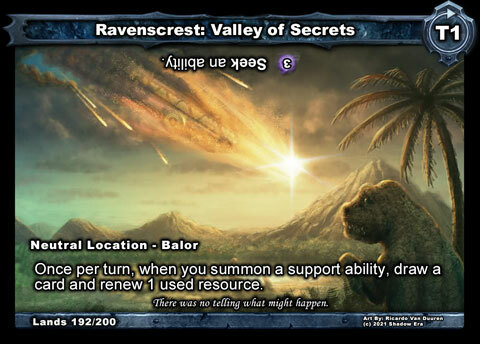 Tagged alignment, lost lands, Shadow era, Shadowera, shattered fates, tribe, wulven.